The parish is situated on the northeast side of Norwich City, and is bounded to the south by the River Yare. The parish recently declared itself a town, and has a population of over 13,500 people. Although dominated by 20th century housing, a result of the proximity of Norwich, some arable land remains to the north and east of the parish, and Racecourse plantation covers the north-eastern corner. A number of forms of evidence from prehistory have survived, and these include a large group of barrows and a Neolithic flint working site, which now lie under modern housing (NHER 9619). The construction of extensive housing areas in the last century has resulted in the recovery of a large number of prehistoric flint tools from across the southern part of the parish. These include Neolithic a leaf arrowhead (NHER 8165), flaked axeheads (NHER 9617, NHER 9621), a scraper (NHER 9622) and flakes (NHER 9691, NHER 12077). 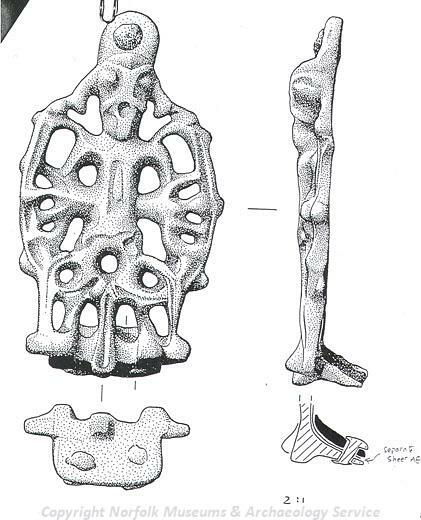 A Mesolithic flaked axehead (NHER 19829) and a Palaeolithic handaxe (NHER 21658) have also been found. Excavation at a site on the western side of the parish (NHER 34516) has recovered Bronze Age pits and ditches, as well as a set of post holes which may indicate a building. Also of possible Bronze Age date is a ring ditch (NHER 9623), also now under modern housing. Objects from the Bronze Age have been recovered from across the south of the parish, including fragments of a Bronze palstave (NHER 9624), pottery sherds (NHER 9625), axeheads (NHER 9626, NHER 31078) and an Early barbed and tanged flint arrowhead (NHER 19142). Iron Age finds are limited to a possible coin hoard (NHER 9627), and a spearhead (NHER 9628). A number of features from the Roman period have also been recorded, including a road thought to run from Brampton to the edge of Norwich at Thorpe St Andrew (NHER 7598). ‘Yermouthe Way’ (NHER 9690), which begins inside Norwich on Kett’s Hill and crosses Mousehold Heath, may also be of Roman derivation. Of particular interest is a 1st century pottery kiln and possible metal working site near Pound Lane (NHER 9629). A settlement site at the western side of the parish appears to occupy a Bronze Age site (NHER 34516), and a number of objects such as spearheads, shield fragments, amphora and pottery sherds, and coins have all been recovered nearby (NHER 9628). A Roman hearth and pit has also been noted, in combination with a number of Roman period objects (NHER 24221), just south of Racecourse Plantation. Due to the predominance of housing in this parish, little metal detecting has occurred and coins (NHER 9637, NHER 17460, NHER 25313) are the most common object recovered, usually from private gardens. Of these, the occasional example is of particular interest, such as a coin of Julius Caesar recovered in 1977 (NHER 19925), which had been minted between 48 to 47 BC, in Nicaea. Other objects recovered include a few brooch fragments (NHER 31078, NHER 32276), a key handle and mount (NHER 40273), and a cosmetic pestle (NHER 44060). In one of the areas of Roman occupation (NHER 9628) it is thought that use of the land continued into the Early Saxon period. Burials have been recorded in conjunction with the deposition of Early Saxon shield fragments, weapons, horse harness and pottery sherds, and this is thought to indicate continuous occupation from the Roman to the Early Saxon periods. It is also interesting to note that excavation in the 1950s discovered the remains of Late Saxon occupation (NHER 9646) underneath the parish church of St Andrews. A small number of individual objects have been recovered, limited to an Early Saxon cruciform brooch (NHER 25313), a Late Saxon mount (NHER 31643, and some Late Saxon pottery sherds (NHER 9644). Thorpe St Andrew is mentioned in the Domesday Book, and it appears to have been a wealthy and populous settlement with extensive animal rearing, although like Norwich it seems to have suffered from over-taxation and fire during the first few decades of the medieval period. Although there is no mention of a church during the Saxon period, the remains of the medieval church of St Andrew (NHER 4653) can still be seen, although only the 15th century south porch survived the rebuilding of 1866. The only other surviving building of medieval origin is Thorpe Old Hall (NHER 4654), a town house built for Sir Edward Paston, who died in 1630. It stands on the corner of a 14th century courtyard house, and the site is thought to have belonged to the Bishop of Norwich in the 12th century. However, a few medieval objects have survived, and although these are predominantly pottery sherds (NHER 9641, NHER 9644, NHER 20730) a small number of metal objects have been recovered, including a lock (NHER 24221), an inscribed seal matrix (NHER 29667), a strap fitting (NHER 32276) and a substantial medieval sword blade (NHER 9645), almost a metre long. Similar objects from the post medieval period have been recorded. The parish’s proximity to Norwich resulted in a number of roads crossing the area, and although the majority of these no longer survive, their routes and names have survived on early post medieval maps, and include ‘Walsham Way’ (NHER 9689), ‘Yermouthe Way’ (NHER 9690) and Ranworth Way (NHER 8166), which remains in the form of a parish boundary. The close proximity to the river, and the road to the port of Yarmouth, resulted in the construction of a number of houses, particularly along this busy route. 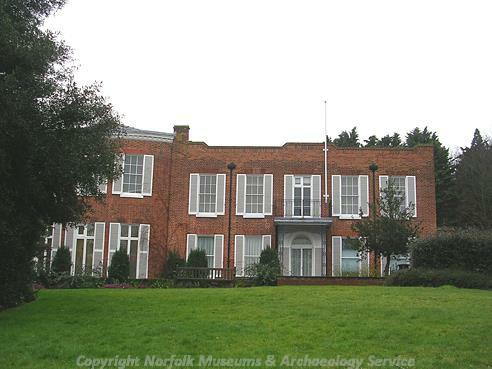 These include Thorpe Lodge (NHER 4650), a fine house that now forms part of the offices of Broadland District Council, but which was originally built between 1755 and 1842, as well as the 18th century red brick Old Thorpe House (NHER 4655). Other houses of interest can be seen along the length of Yarmouth Road (NHER 4657, NHER 7139, NHER 46029). Also of interest are the Rushcutters Inn (NHER 4761), a timber-framed public house that is thought to date back to the 16th century, and the Kings Head Inn (NHER 7140), an inn of the 17th century. Both are situated close to the Yarmouth Road and the River Yare, and may have been inns since their inception. Also of interest, although set slightly further away from the main post medieval settlement, is Thorpe Tower (NHER 4651), thought to have been built around 1880 and inscribed with words from Horace in Latin. Of more interest is the site of Thompson’s folly, the remains of which can be seen today, and which is thought to have been built between 1760 to 1770, providing views as far as Yarmouth. From the more recent past is St Andrew’s Hospital (NHER 9693), a complex of buildings constructed from 1811 as the Norfolk County Asylum, and may be the oldest mental hospital in the country. The complex opened in 1814, becoming the Norfolk Mental Hospital in 1920 and then St Andrew’s Hospital in 1923. The hospital continued until 1998, when it was decommissioned and converted for residential use, during which several interesting features were discovered, including an original white ceramic dissection table, a barrel-vaulted theatre and some Art Nouveau glass. The hospital was used as a war hospital during World War Two, and the cemetery contains the graves of a number of Polish refugees. A number of remnants from World War Two can also be seen, including over forty anti-tank blocks (NHER 32535, NHER 32536, NHER 32537) situated near the Yarmouth railway line (NHER 13586). Others formed part of the Norwich perimeter defences (NHER 20338, NHER 32532), though many of the defences have now been demolished (NHER 32531, NHER 32548). Ruth Fillery-Travis (NLA), 27 April 2007. Access to Archives, 2005. ‘Records of St Andrew’s Hospital, Thorpe St Andrew’. Available: http://www.a2a.org.uk/html/153-sah.htm. Accessed: 27 April 2007.
http://www.visionofbritain.org.uk/relationships.jsp?u_id=10104830. Accessed: 26 April 2007. Norfolk Record Office, 22 June 2006. ‘Norfolk Record Office Information Leaflet 15: St Andrew’s Hospital Patient Records’. 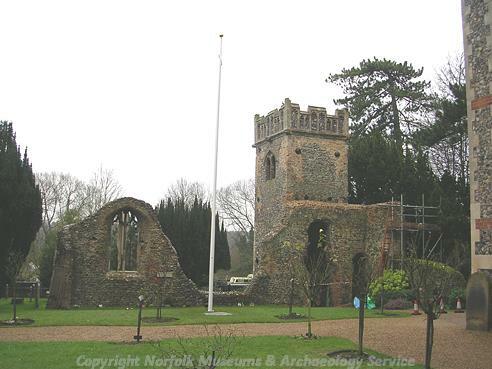 Available: http://archives.norfolk.gov.uk/documents/pdf/NRO015_SAH.pdf. Accessed: 27 April 2007. Roberts, A., 2001. ‘Index of English and Welsh Lunatic Asylums and Menetal Hospitals’. Available: http://www.mdx.ac.uk/WWW/STUDY/4_13_TA.htm#South%20East%20England. Accessed: 27 April 2007. Wikipedia Authors, 16 April 2007. ‘Thorpe St Andrew ‘. Available: http://en.wikipedia.org/wiki/Thorpe_St_Andrew. Accessed: 26 April 2007.